Tanners Square: This place is just behind the Town Hall and the Burg Square. It's more than a square, more so a patio. As a matter of fact originally there were gates at the ends of the square. In the fourteenth century it was occupied by a guild of tanners, but in the fifteenth century they were moved to another location because of the smell of leather. 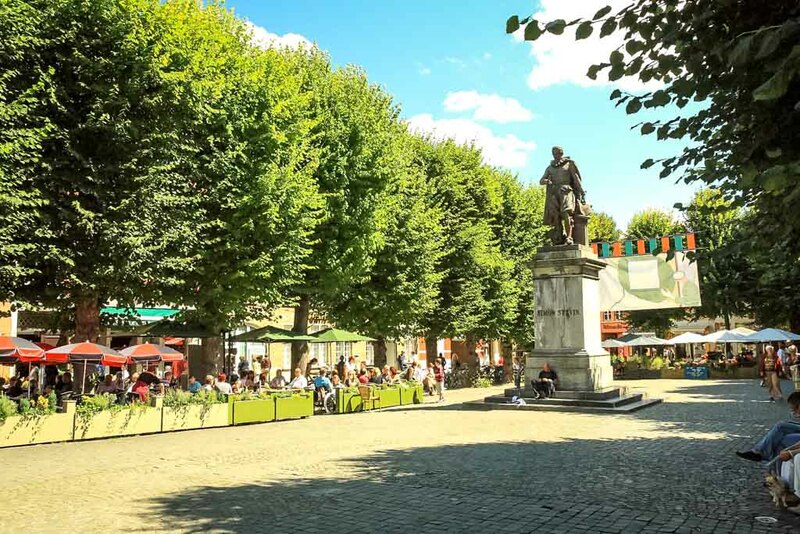 Today there are several restaurants, a hotel (Duc de Bourgogne), and at the end of the square there is a pier from which you can take a boat trip to explore the city. On this square you will see a column supporting two lions and the emblem of the tanners. Its a great place to sit outside and enjoy a beer (or two ) and people watch ! The Fish Market is s till an active fish market under a covered arcade. There used to be two fish markets in Bruges. The Vismarkt, which was the rich people market and the Huidenvettersplein (Tanners Square), which served the poor. Located between Braambergstraat and Steenhouwersdijk, this fresh fish market was taking place in the covered arcade. 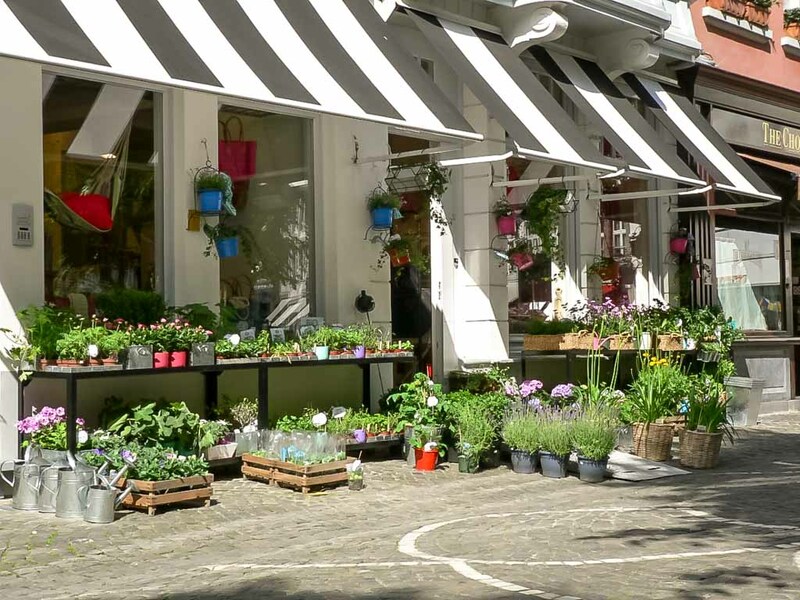 Nowadays, you can find the Vismarkt every Tuesday to Saturday morning. Other kinds of merchandise such as original watercolours, paintings, handwoven scarves, antique dolls, pottery are also sold. Also every Sunday in July and August, you may catch a local tango dance school practicing! Simon Stevin Square is where the very best Belgian Chocolates and Pralines are to be found!! The statue of Simon Stevin is just a few minutes walk for the Market Square This is a pleasant little square just off the main shopping street. There are a host of restaurants, cafes, chocolatiers and other shops by the square too. The Chocolate Line and Dumon are directly on the square itself and just up Mariastraat on the left you will find The Old Chocolate House. Since just about everything in Bruges historic center is beautiful, an average Bruges square is lovely. The best part of this square is that it is traffic free. It is lined with trees and cobblestones, and it is surrounded by shops. If you like your history and/or architecture, then Van Eyck Square is one which you should try to get to. 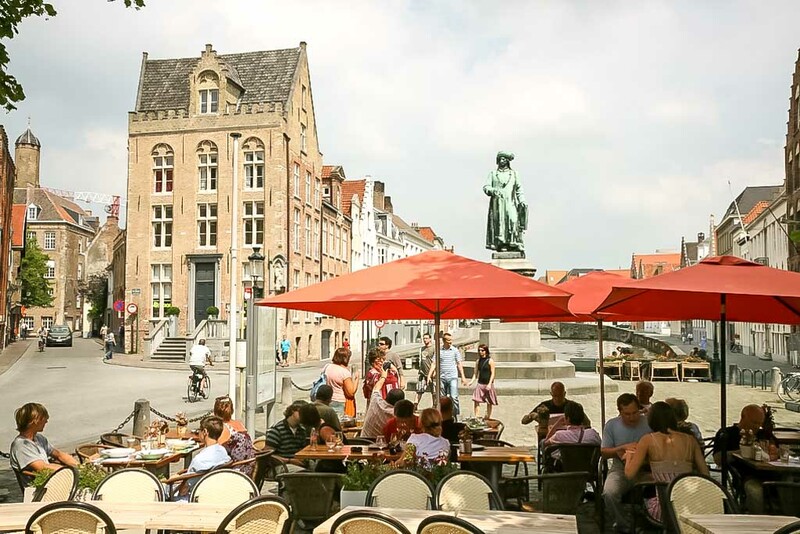 Jan van Eyck Spaure: As in so many squares in Bruges you can enjoy a quiet drink and a snack.This is a place to sit and enjoy the superb view of the mediëval canal that once was the harbour of Bruges. 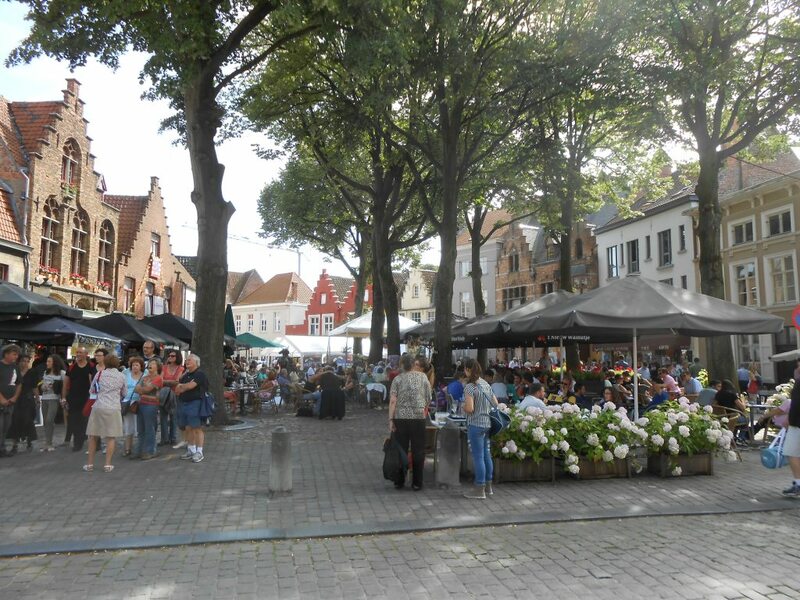 In the middle of the square you will notice the statue of the famous Flemish painter after whom the square was named. You can also admire the Old Toll House. This building was used from 1477 to levy tolls on goods imported by ship from Bruges' outer. Look out for Bruges' oldest inhabitant: the bear! 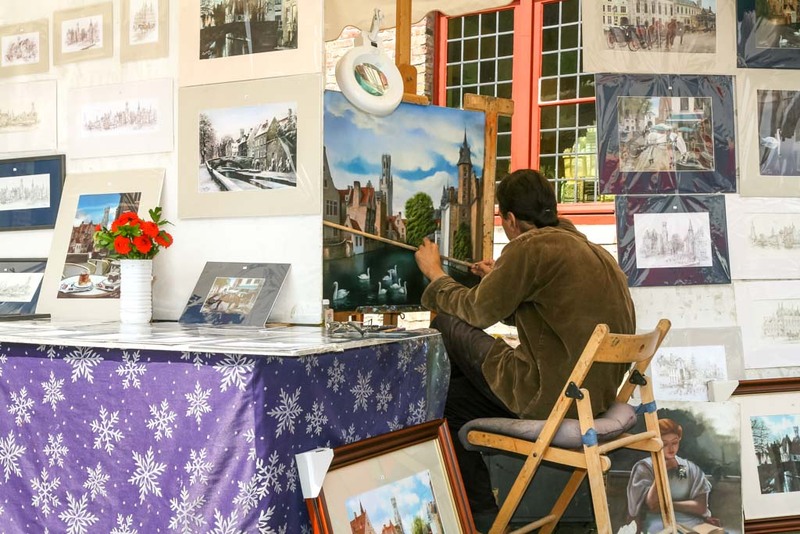 The Arents Courtyard (Arentshof) is one of these places where you can escape Bruges' busy shopping streets. Take your time to relax and calm down here. Enjoy the breathtaking view of the majestic spire of the Church of Our Lady and watch the coming and going of the horse drawn carriages and tourists. Here you can catch your breath for a moment after walking through the busy shopping streets. 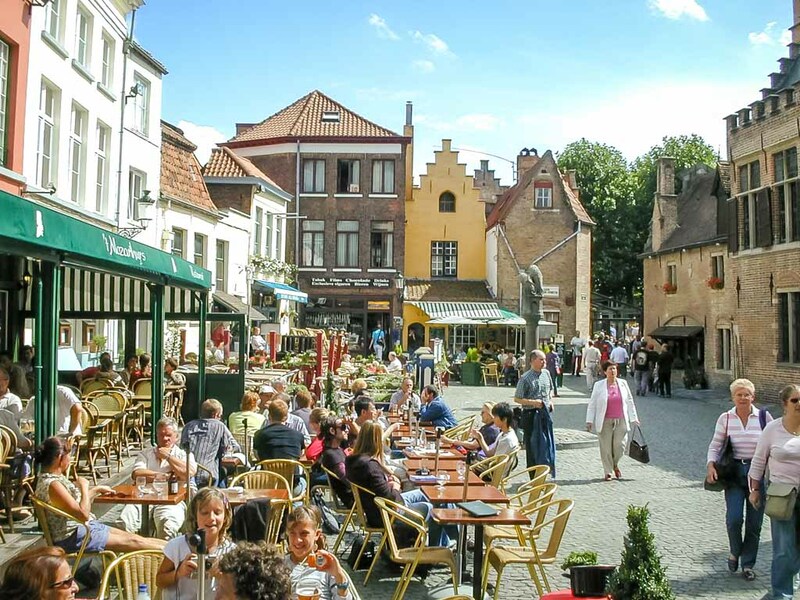 Walplein is the ideal place to take a break for a tasty "Brugse Zon" (Bruges beer) brewed in the nearby brewery "Halve Maan". Punta Est: One of the most well situated cafe's to have a great lunch, or just a beer or coffee. 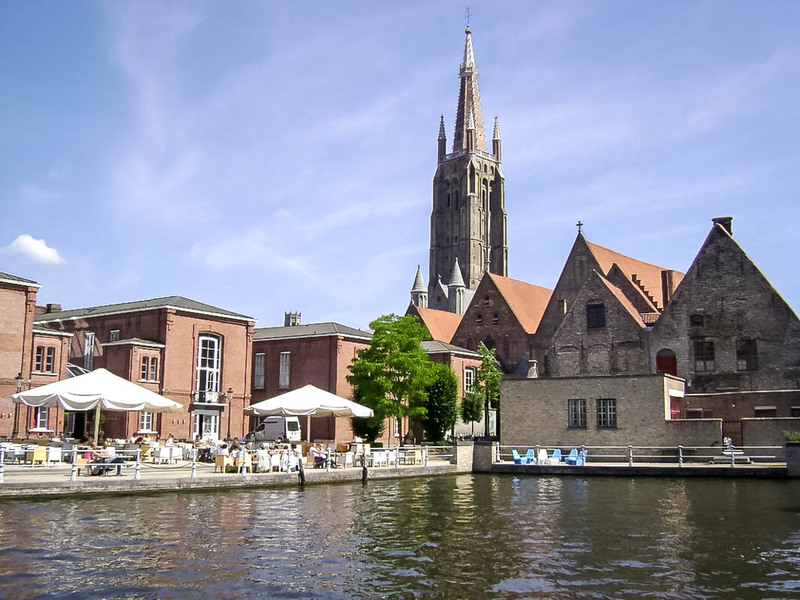 Located out of the hustle and bustle of the tourist district along a picturesque canal and the Best place in Bruges to catch the sunset with friends. 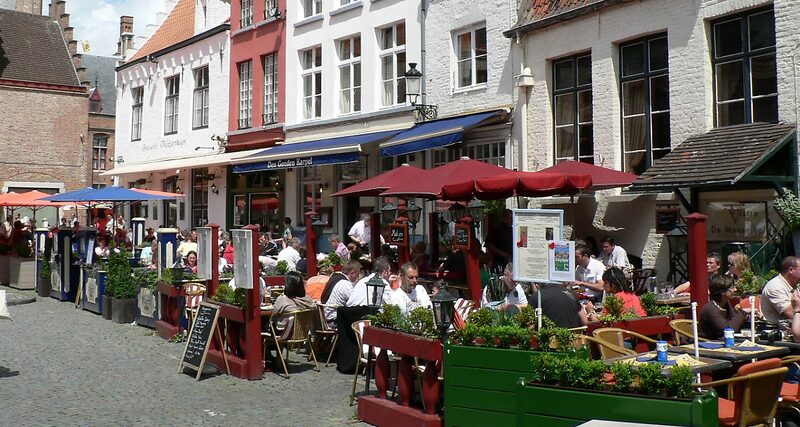 Sit and relax in the peace and quiet away from the Bustle of the rest of the centre of Bruges. Chill for awhile and recharge you batteries before heading back into the fray.